A stay at Westward Inn places you in the heart of Crescent City, within a 5-minute drive of Del Norte County Historical Society and Ocean World. Featured amenities include a 24-hour front desk, laundry facilities, and coffee/tea in a common area. Free self parking is available onsite. With a stay at Super 8 by Wyndham Crescent City in Crescent City, you'll be a 5-minute walk from Crescent City Harbor and 9 minutes by foot from Ocean World. Free self parking is available onsite. 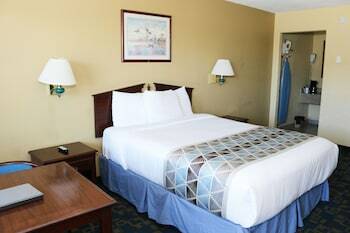 When you stay at Front Street Inn in Crescent City, you'll be by the ocean, within a 10-minute walk of Ocean World and Beachfront Park. Free self parking is available onsite.